Many homeowners and DIYers often have old wood stored somewhere that’s not inside the house. This wood can often be found in the backyard underneath a tarp, under a shed, or it can be an old piece of wooden furniture. After all, where else would you put a stack of leftover 2x4s, old cabinets, or other pieces of wood that are no longer effectively being used, but could have the potential to see life again? One of the beautiful things about wood is that it can be restored and repurposed. Using reclaimed wood to create desks, shelves, and even works of art have become a hot topic lately. Consumers are often seeking a vintage look and instead of paying a premium to have it through an antique store or dealer, they realize they already have the wood themselves. In order to begin any project involving old wood that’s been outside, you must first clean it effectively. 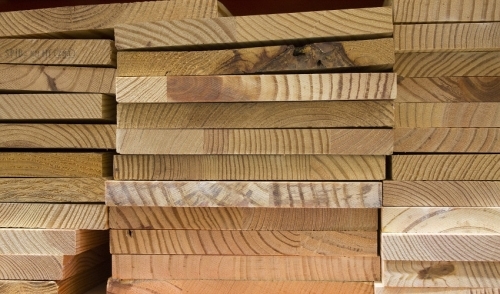 Constant weather and temperature changes can take a serious toll on wood. Throughout the year, the wood has taken a beating from the elements and must be cleaned before the wood can be effectively re-used again. Start by letting the wood dry first. Even if it hasn’t rained in a few days let the wood sit out in the sun a couple of hours before starting to clean. One of the biggest threats to wood that’s been outside is mold. Since too much moisture causes mold, there’s a good chance the wood might be slightly damp and will need to be fully dried. Keep in mind depending on the status of the wood before beginning the cleaning process; you might have to start by hosing it down from the start to remove bugs, old sap, or mud. Afterwards, you may let it fully dry and lightly sand it down to give it back its smooth texture. This will also prevent slivers or splinters while cleaning and repurposing down the road. Following the drying of the wood, it’s time to clean and sanitize it. Scrub the wood down using soapy water or a combination of detergent, bleach, and water to clean the wood. Always remember to protect yourself with proper safety equipment from the fumes of the cleaner and any mold spores. If the wood isn’t cleaned the first time, don’t be afraid to restart the process. You can even choose to dry scrub the wood first and then clean it to further break up any extensive mold or mildew. If you are cleaning old painted wood, make sure to use a tad bit more bleach and to scrub lightly to avoid scraping any paint unless that is your goal. Once the wood has been effectively cleaned, thoroughly rinse it down and begin to let it dry. After the wood has been cleaned and dried, feel free to take whatever next steps you feel necessary such as adding a sealer or cutting it for your next project. Make wood great again and turn it into whatever creation you want.